“When you’ve got the right feed for your horses you’ll do well”. Eleanor McGillie speaks to trainer Stuart Crawford from the 2018 Perth Festival earlier this year for our 20th anniversary magazine, The Inside Scoop. The sun was shining over Perth Racecourse when we spoke to trainer Stuart Crawford and times are good for Northern Ireland trainer Stuart Crawford. Nestled in the stunning parklands of Scone Palace, Perth Racecourse is Scotland’s most northerly course and one of the UK’s favourite days out. The 2018 festival is no different. In between races I got to chat to the respected trainer about how vital it is to get the right feed for his horses. “When you’ve got the right feed for your horses you’ll do well,” Stuart said. “I have been feeding Bluegrass Horse Feeds for 20 years now, pretty much since they started, and I have never had a problem with it. I am happy with it and the horses are happy with it. Stuart Crawford is based at his Newlands Farm near Larne in County Antrim alongside his brothers who make up Crawford Bros Racing. He first hit the headlines in 2008, when he sent out 10-year-old mare Oh Jackie to register his first racecourse success in the prestigious La Touché Cup at the Punchestown Festival. It was a victory which earned Stuart the spotlight he deserves. He first took out a full public license in 2011 and trains his horses on the well-appointed, family-run Newlands Farm, alongside his brothers Steven, Ben (stable jockeys) and Ross. In 2013, Stuart and Steven had a great day at Ladies’ Day at Aintree when unbeaten Legacy Gold claimed the John Smith’s Mares’ National Hunt Flat Race by a-length-and-a-half. Those stunning victories for Now Let Go and Legacy Gold have provided the team at Crawford Brothers Racing with their most notable wins to date. 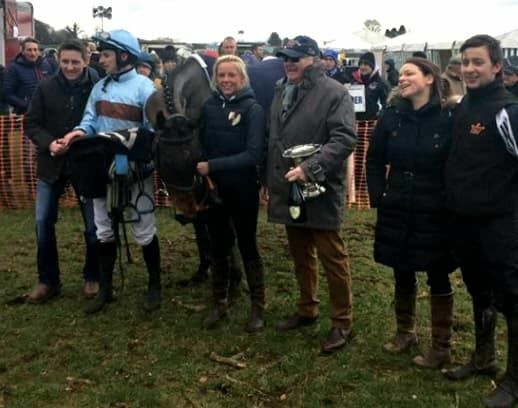 In May 2016, Crawford Brothers Racing trained the progressive 20-1 shot Now Let Go to win the Irish Thoroughbred Breeders Association Premier Fillies Bumper at the Punchestown Festival under a positive ride from claimer Steven Clements. The Flemensfirth mare made all the running from halfway out to win by two-and-a-quarter lengths to claim the first prize fund of €24,500. Another one of Team Crawford’s best horses Fine Rightly has been a fantastic flag bearer for the yard, winning Grade 2 bumper and the Grade 3 Imperial Call Chase has been his career highlights so far. With a win on home soil in Cork in 2016. Bluegrass Horse Feeds is an Irish horse feed producer based at its mill in Eglish in County Tyrone. Bluegrass Horse Feeds, which produces quality and innovative horse feeds, is the Ireland Team Member of Kentucky Equine Research. The Bluegrass Horse Feeds team works closely with owners, riders and trainers using the latest nutritional research and technology to achieve optimum performance from their horses. Bluegrass distributes its feeds the length and breadth of Ireland and has over 200 stockists. If you need nutritional advice please fill out our diet request form and while you're here find out your nearest stockist.